What power on earth, or rather under it, tempted you to purchase that abomanible Sappho4! I had fallen into that trap myself once,— the name of the book is both innocent and classic—and honestly wished no to save you the pain which it gave me. So you see you thwarted the one Christian effort of my life. Kit5 persisted in leaving Monday, and we really did not get time to write the combination letter, then you know Kit's attitude toward the Pounds6 isn is not any too amorous. Say, you should have seen Kit and Mr. Myres7, they just set me in the background completely, Kit went to church twice on Sunday to hear him and they just had raptures over each other when he called, you may know they found each other interesting as he stayed 4 hours. If ever you meet Katherine again, you will her a learned and scholarly, not to say enthusiastic, dissertation apon Prof Hunt8 and Mr. Myres. I feel awfully lonesome since all you fellows are gone, and am consoling myself with French History, Gorge Eliot9, and e endless rides over the prairie. I B Kit and I spent Sunday evening with Mrs. Garber10. James McDonald11 still makes night hideous by wailing for Lincoln3 and Louise12, he has kissed the combination photo13 until her face is almost obliterated, he does all the caressing on her side, I wonder if the one14 at North Platte15 is not almost in the same condition by this time. By the way you must go down and demand one of those photos. Jim never said what I was afraid he would to Kit at all, he never noticed it. 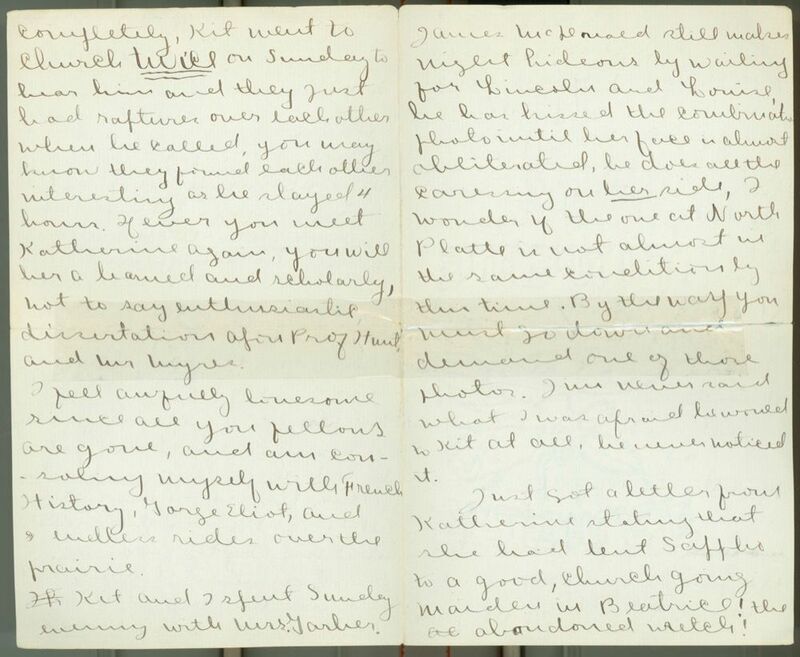 Just got a letter from Katherine stating that she had lent Sappho to a good, church going maiden in Beatrice16! the ae abandoned wretch! how could she do it, I at least try to warn others from those pitfalls which I have digged for mine own feet.— Now, I flatter myself that sounds very biblical.—Why on earth didn't you ask me for a book to read on the train I forgot to give you one, it was a beastly shame! You left Mr. Kenyon's17 Coulter18 here, shall I send it or bring it up in the fall? Kit and I drove a good deal, and I continued to punctuate my effusions with the whip apon the hor horses back, until the poor creature presents a most startling figure of one vast "homogeneous amalgamation of a hetrogeneous mass" of comas, periods, colors, semicolons, and—as our discussions were generally very rapturous—of many exclamation points. I know you will indeed rejoice to hear that the Cather family have a new lap spread! I have been working on some frogs all morning for the purpose of getting some information concerning their circulatory systems. Both they and myself are rather tired now, so I think I shall kill the little fellows, and quit for the day. 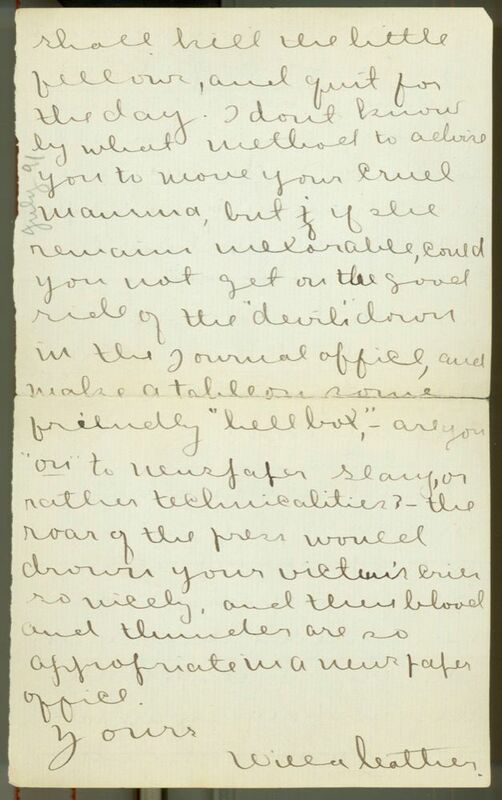 I don't know by what method to advise you to move your cruel mamma19, but if she remains inexorable, could you not get on the good side of the "devils20" down in the Journal21 office22, and make a table on some friendly "hell box,"23—are you "on" to newspaper slang, or rather technicalities?—the roar of the press would drown your victim's cries so nicely, and their blood and thunder are so appropriate in a newspaper office. 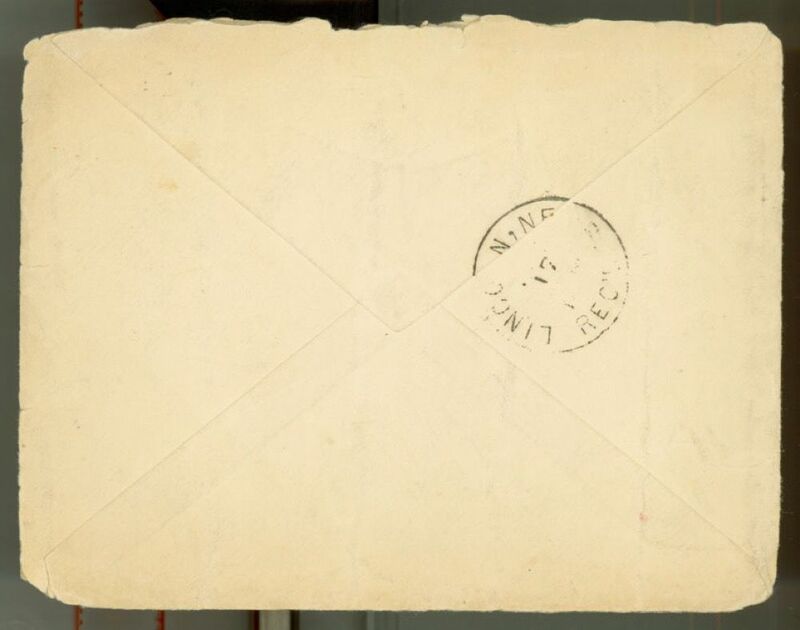 Document is four leaves, handwritten on recto of each leaf only. Includes one envelope, handwritten. The photo of Cather together with Louise Pound to which Cather is referring. Cather is implying that Louise Pound's classmate James B. MacDonald, lived in North Platte, NE, also had and was kissing the photo. A printers devil is an apprentice worker in a printing establishment. Mariel Gere's father, Charles Gere, was the publisher of the Journal. Fallen, damaged, or discarded type was tossed into a hell box for later sorting. Wing, Katherine Weston (1871-1903) (“Kit”). Cather’s friend. Born in Nebraska, Katherine was the third of four children born to J.B. and Helen Weston, who became well-to-do residents of Beatrice, NE, thirty miles south of Lincoln, NE. 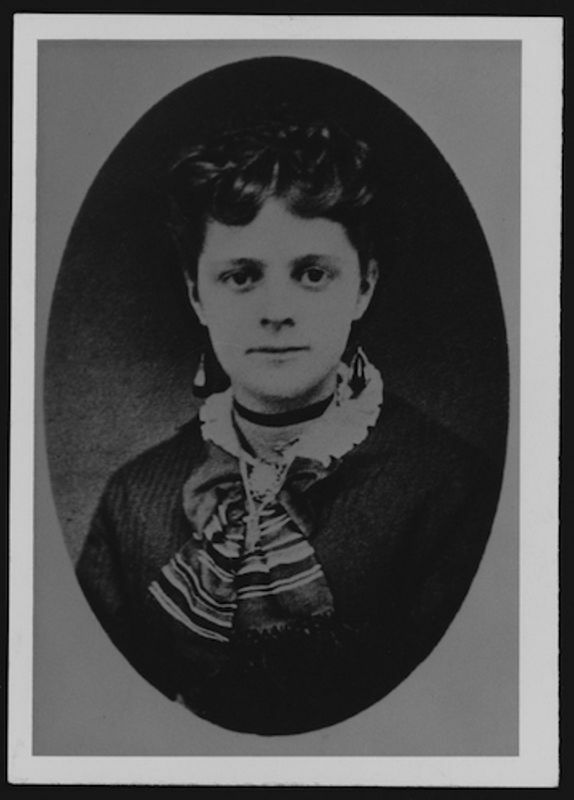 She entered the University of Nebraska in 1887, but withdrew for several years due to poor health. When she returned in 1891, she met Cather. 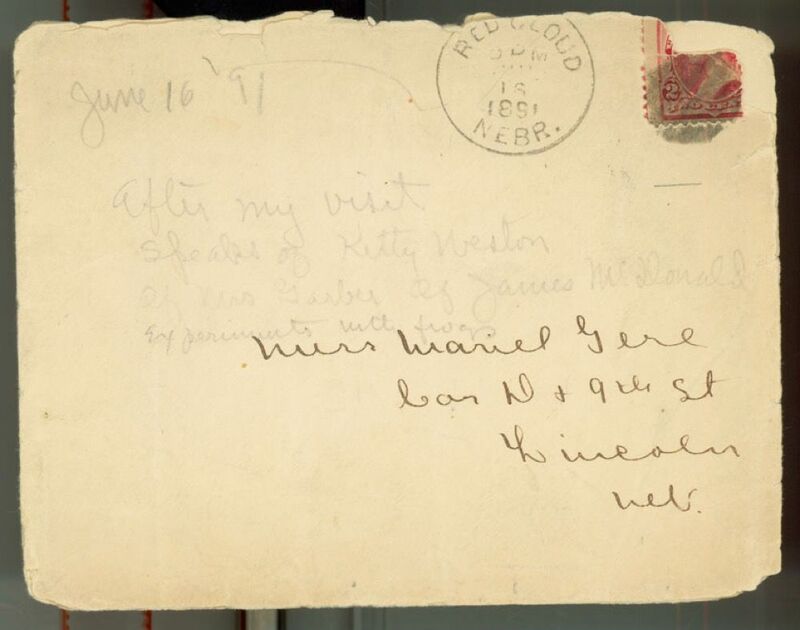 She visited Cather in Red Cloud in the summers of 1891, 1894, and 1895, and Cather visited Weston in Beatrice in June, July, and December 1895, where Cather also enjoyed the company of Katherine’s younger brother Herbert (Bert). Katherine attended the library school of the University of Illinois as a member of the class of 1898 but withdrew in 1897. 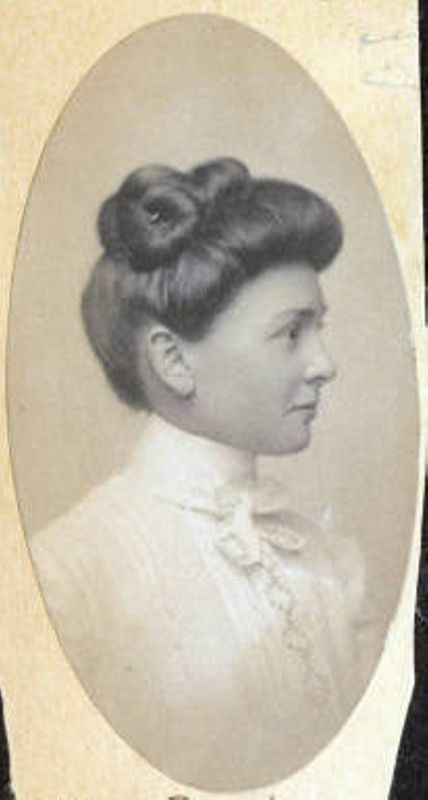 She then remained at home until her June 1902 marriage to Thomas E. Wing, a fellow 1894 University of Nebraska graduate. She moved with him to Scarsdale, NY, where she died of pneumonia in 1903. 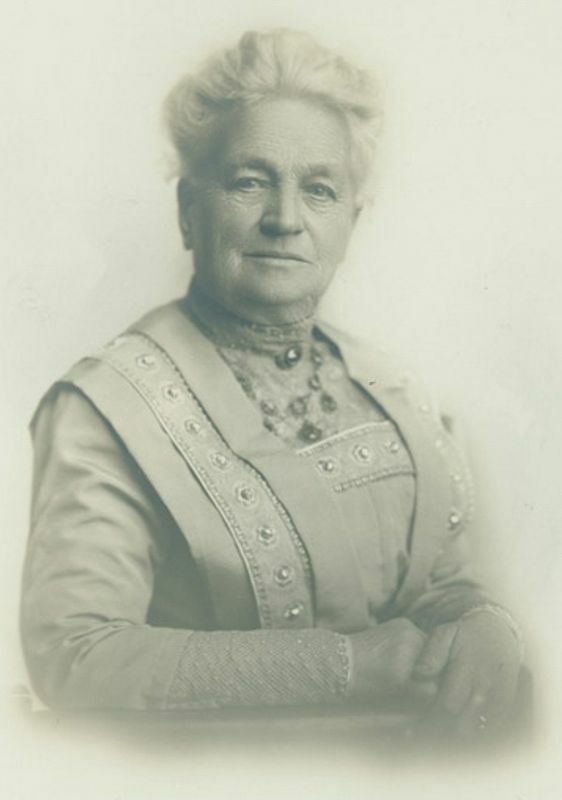 Pound, Louise (1872-1958). American folklorist and university professor. 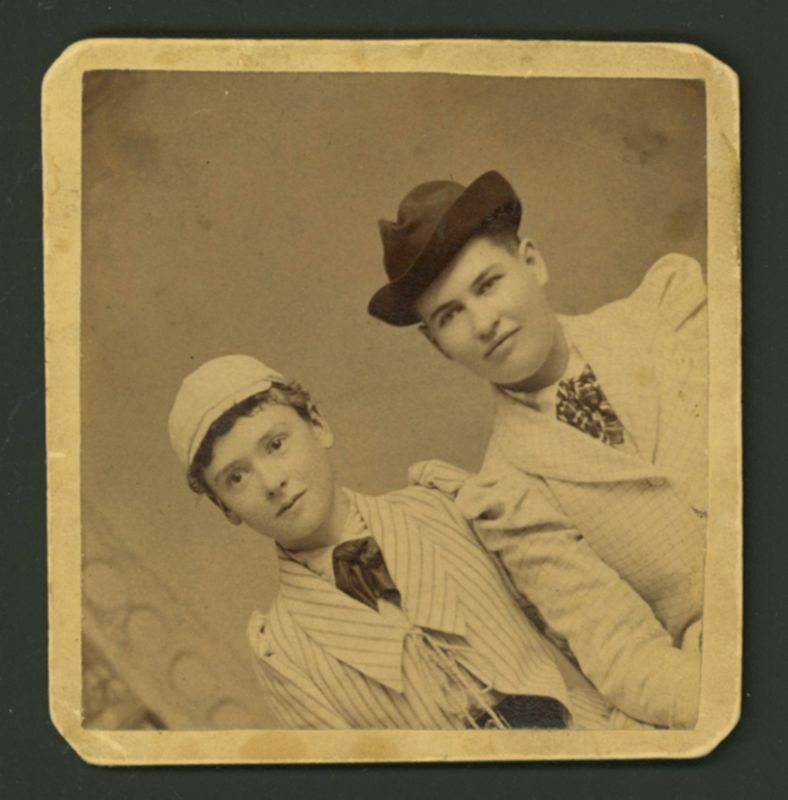 Pound and Cather met when both were students at the University of Nebraska in Lincoln, where Cather also knew Louise’s brother Roscoe and sister Olivia. Cather was deeply infatuated with Louise, who was both an outstanding student and an accomplished multi-sport athlete. 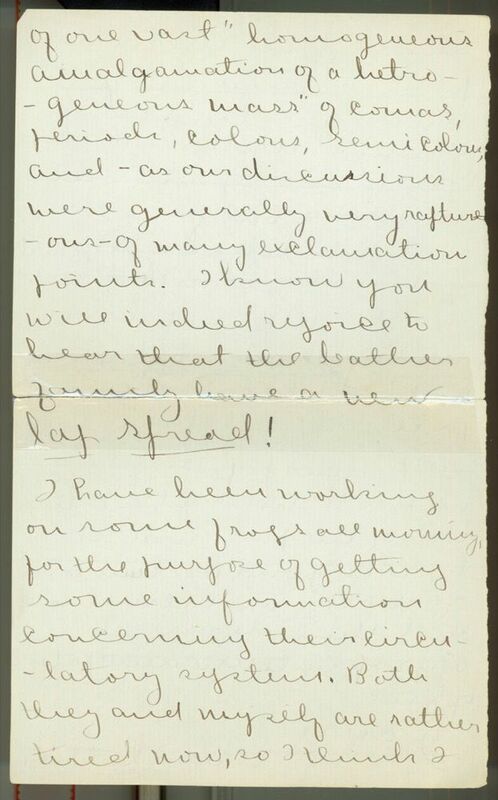 Pound visited Cather in Red Cloud, NE, several times, but she apparently did not reciprocate Cather’s intense affection, and Cather’s lampoon of Roscoe Pound in “Pastels in Prose” (1894) caused a rift between the two women. Pound earned a B.A. from Nebraska in 1892, an M.A. in 1895, and a Ph.D. from the University of Heidelberg in 1900. She was a professor in the English department at the University of Nebraska, where she taught Cather's sister Elsie, until 1945. From 1954-55 she served as the first female president of the Modern Language Association. Pound, Roscoe (1870-1964). American law professor. Born and raised in Lincoln, NE, Roscoe Pound received bachelor’s and master’s degrees in botany from the University of Nebraska 1888 and 1889, respectively. He studied a single year at Harvard Law School (1889-1890), returning to Lincoln in 1890, where he simultaneously practiced law and studied botany under Charles Bessey, receiving a Ph.D. in 1897. In 1894 Cather published a lampoon of Pound as the sycophantic “University Graduate” in the Hesperian student newspaper; this lampoon has been credited with rupturing her relationship with the entire Pound family, including her friends, Roscoe’s sisters, Louise and Olivia Pound, who also studied at the university. Roscoe became, successively, instructor (1895), assistant professor (1899), and dean of the law school at the University of Nebraska (1903). As dean he instituted sweeping reforms, including the case study method of teaching he had learned at Harvard. He then served as professor at the law schools of Northwestern University (1907-1909), the University of Chicago (1909-1910), and Harvard University (1910-1920) and dean at Harvard (1920-1936). He was awarded an honorary degree by Nebraska in 1917, the same year that Cather was similarly honored, but there is no evidence of any other contact between them after 1894. 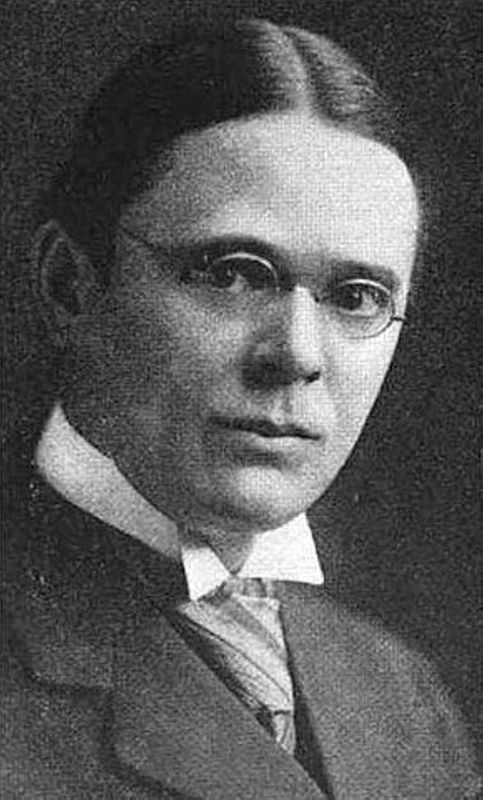 Myers, Clement L. (1865-1929). American Episcopal priest. Born in Ohio, the Rev. C.L. Myer held services at Grace Episcopal Church in Red Cloud, NE, in 1891, but he was probably not the resident priest. Married in 1894, he and his wife Myrtle had three children. He served parishes in Elmwood, NE, Dorchester, NE, and Oakdale, NE, and is buried in Lincoln, NE. Hunt, Ebenezer W. (1851-1913). University of Nebraska professor; agriculturist. Born in New York, Hunt joined the faculty of the University of Nebraska in 1887 as a teacher of rhetoric and oratory. A brilliant and eccentric teacher, he resigned in 1893 because of his health, retiring to a farm in Otoe County, NE, with his second wife and three children. Cather wrote an essay on Thomas Carlyle for Hunt’s rhetoric class, which he sent to the Nebraska State Journal, where it appeared on March 1, 1891. Cather later claimed that the sight of her work in print gave her the desire to be a writer. 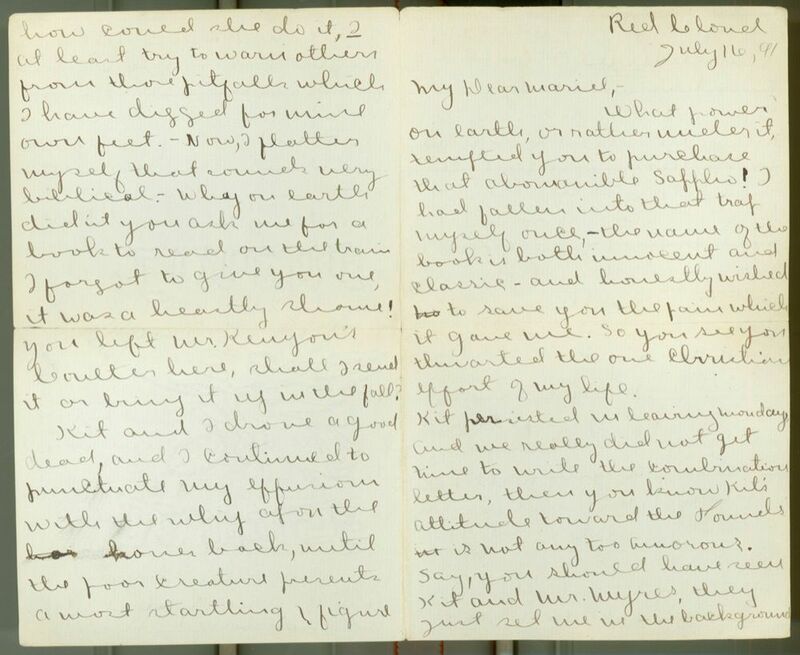 Cather mentions Hunt a few times in her letters. Cross, Mary Anne Evans (1819-1880) (“George Eliot”). English novelist and poet. Born in Warwickshire, England, to Robert Evans, estate manager for Arbury Hall, and his wife, Christiana, Mary Ann Evans was educated at boarding school until age sixteen and, continued her education in the Arbury Hall library. In 1850, after her parents’ deaths, she moved to London to become a writer, working first as subeditor of the Westminster Review, to which she also contributed. In 1851 she met critic George Henry Lewes; in 1854 they began living together even though he was married and could not obtain a divorce. 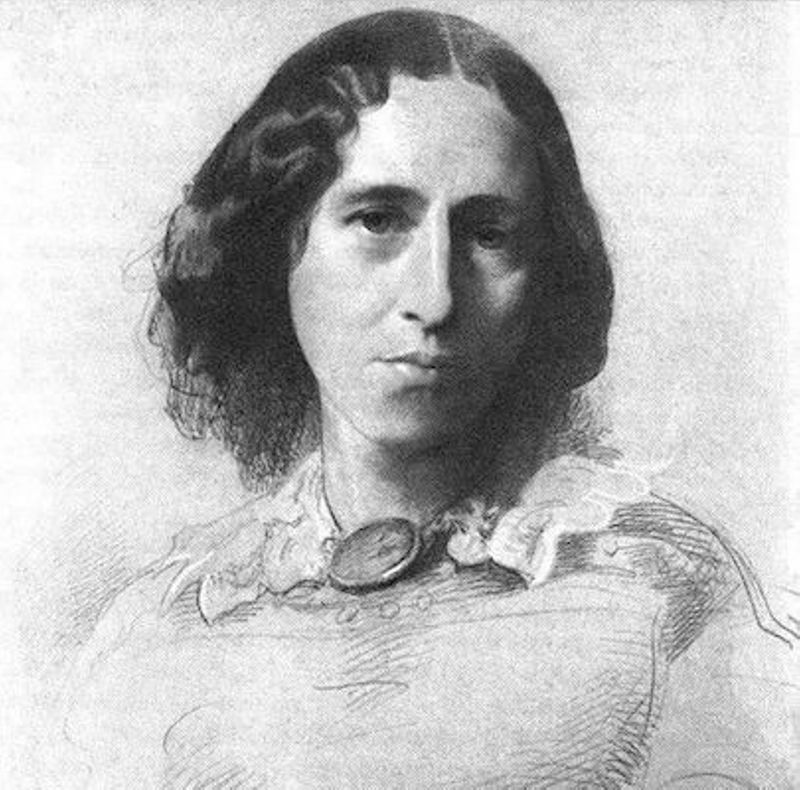 In 1857 she published the first of her Scenes of Clerical Life under the pen name of George Eliot. Her novels Adam Bede (1859), The Mill on the Floss (1860), Silas Marner (1861), and Middlemarch (1871-72) were popular and esteemed by critics for their psychological realism. After Lewes’ death in 1878, Evans married John Cross in 1880, but died a few months later. Cather read Eliot’s novels as a young woman and believed that students should be exposed to them. Garber, Lyra Wheeler (1855-1921). Red Cloud resident. Born in Georgia, Lyra moved with her family to Illinois in 1856 and to California in 1859, where her father kept hotels in Nevada County; she first met Silas Garber there in 1866 when he was visiting his elder brother Jacob. Lyra reportedly attended a convent school in Grass Valley, CA, and a finishing school in San Francisco. In 1875, when Silas Garber was governor of Nebraska, he returned to Grass Valley and married Lyra Wheeler. After his term was up in 1878, the couple moved to Red Cloud, NE. Widowed in 1905, Lyra stayed there until 1912. In 1914 settled in Grangeville, ID, where a sister lived, and cut her ties to Nebraska. In 1915, she married Swan Anderson, a considerably-younger bank cashier. They moved to Oregon in 1918, where she died. Cather observed Silas and Lyra Garber during their Red Cloud years and made them the prototypes for Daniel and Marian Forrester in A Lost Lady (1923). McDonald, James Boyd (1869-1967). Nebraska banker. Born in Omaha, NE, James moved with his parents, Charles and Orra McDonald, and siblings to North Platte, NE, where his father, an early settler in the county, owned a store and founded the McDonald Bank. James entered the University of Nebraska preparatory school in 1886 and matriculated with the class of 1892. Active in school affairs, he founded and edited two short-lived school papers, the Sophomorian and the Lasso; Cather and classmate Louise Pound both wrote for the Lasso at its outset, and Cather seems to have thought that McDonald was interested in Pound. After graduation, McDonald returned to North Platte, working in his father’s store and later entering in the banking business with his brother William. He married Emily Houska after 1914; he retired in 1934 and the couple moved to Omaha; both are buried in North Platte. Kenyon, Frederick Courtland (1867-1941). American naturalist. Kenyon graduated from the University of Nebraska in 1892, and served as an instructor there from 1893 to 1894, publishing articles on fossils and insects. He was appointed to the faculty of Clark University by 1896, and was a member of the American Naturalist Society. An expert on the brains of bees, he discovered and described a group of cells which are named Kenyon cells for him. After going to work for the Department of Agriculture in Washington, D.C., he was dismissed and then committed to a mental institution there in 1899.